Almost every available space in Lagos has been converted to an open market. The walkways, railway tracks as well as pedestrian bridges on major roads have been turned into markets by traders. And government has looked on with indifference. There is no doubt that this unregulated commercialisation of every spot in Lagos gives the busy city a raucous outlook. Many believe that it would be impossible for the Lagos State government to transform the metropolis into Africaâ€™s model mega city and global economic hub, as it aims to, if the indiscriminate trading continues across the state. From Ajah Roundabout to Obalende, CMS, Costain, Oyingbo, Yaba, Ojuelegba, Oshodi, Ojota, Ikorodu Roundabout, Egbeda, Igando, Iyana-Iba, Mile Two, Second Rainbow, Agege, Iyana-Ipaja, Ikeja (Under Bridge), Ile-Epo, Tollgate, the story of endless buying and selling on walkways is almost the same. This manner of selling goods at unapproved places, especially at major bus stops, has existed for decades in Lagos. But the rapid increase and spread to every part, which has further endangered lives and hampered the free movement of persons and vehicles, has become worrisome in recent times. Their activities on the highways, walkways and rail tracks have led to many fatal accidents. Many would still remember how a truck in November 2017 developed a brake failure, veered off the expressway and crushed a woman selling articles by the roadside. The accident occurred at Tollgate, on the boundary between Lagos and Ogun states. The woman reportedly died before her colleagues could get her to the hospital. Many survivors at different locations have been left with injuries, and permanent disabilities. Motorists and commuters are often subjected to hours of torture due to the traffic caused by the traders who occupy major roads with impunity. During rush hours after the close of work, the traders come out in full force to take over a large chunk of the road, leaving a tiny part for vehicles to struggle through. On rail lines, it is common to see traders flagrantly displaying their wares for prospective buyers to patronise them. Whenever the train is approaching, they hurriedly move away their goods only to reassemble them in quick succession as soon as the train passes. It is common to have a convergence of traders selling all manner of goods on railway tracks. These â€˜marketsâ€™ are frequented by those seeking cheap, fairly used clothes and other used and substandard wares. Some people also sell foodstuffs, mostly in the evening. On a daily basis, traders and their customers turn these locations to huge markets with hardly any confrontation by law enforcement. This risky practice has also led to the death of some people, especially those who were not quick enough to depart the scene for an oncoming train. On Thursday last week, a train on the Sango-Iddo route derailed in the Mangoro area of Agege, Lagos. It is not known yet how many casualties were recorded. A shop owner who deals in provisions at Ile-Epo, Agbado Oke-Odo Local Council Develop- ment Area (LCDA) in the state, Mrs. Anuoluwa Dada, told the reporter that no volume of sales would be enough to tempt her to ply her trade on a rail track. She described those trading at the unapproved place as being reckless with their own lives. She, however, asserted that government was in the best position to eliminate indiscriminate trading the in the state. She said the state government had not yet launched an aggressive campaign as expected on those occupying prohibited places, submitting that that was the reason traders were daily increasing in those areas for business. Perturbed by the development, the Lagos State government has, in the past, established several task forces with the objective of ridding the state of trading at these unusual spots. Despite the efforts of the officials in charge of the agencies, there has been strong resistance from the traders. They deploy every tactic to beat the stateâ€™s officials to remain in business. The areas notorious for rail track trading include Ikeja-Along, Yaba, Oyingbo, Agege, Agbado-Crossing, Mushin and Yaba bus stops. It was also gathered that train trips that have been scheduled to arrive at their destinations at given times are sometimes disrupted or delayed. A journalist who sometimes takes a train from Oshodi to Agbado-Ijaye said the ride would be halted for longer than necessary for the traders to clear their wares from the track before the train would continue its journey. Some keen observers have argued that enforcement of the ban on trading on railway tracks was more effective during the administration of Governor Babatunde Fashola. They believe that the enforcement of that ban appears to have been relaxed by the current administration. What still remains unclear to many people are those deployed to collect levies from petty traders at the unauthorised places. 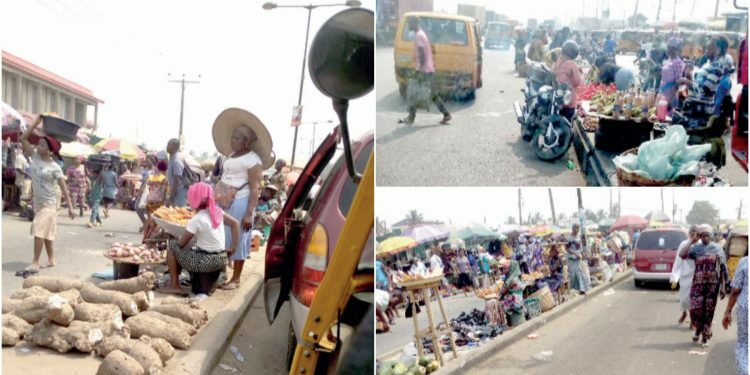 Reacting to the collection of levies, a trader who operates very close to a rail track in Agege, said she pays two different levies daily to people who claim to be council workers. Hear her: â€œOne will come in the morning while the other will come at night. They donâ€™t wear uniforms, but everybody knows that they are from the council. You dare not say you wonâ€™t pay because they will seize your goods and threaten to take them to the council, where your chances of reclaiming them are slim. â€œI have been here for seven years. I know it is risky but this is what I use to train my children in school. I know it is a risky business but I cannot go and steal. Iâ€™m not exactly on the track. When the train is moving, I donâ€™t need to pack my wares. If you go and rent a shop, you wonâ€™t get this same number of people that pass here every day. On January 6, the Lagos State government warned traders and other persons doing business on rail tracks in the state to leave or face arrest and prosecution. The Lagos State Environmental and Special Offences Unit, also called Lagos State Task Force, gave the warning as the activities of the traders were portraying the state in bad light. Chairman of the unit, Olayinka Egbeyemi, a chief superintendent of police, gave the warning through the head of public affairs, Adebayo Taofiq. He said there would be a clampdown on all illegal activities in rail corridors in Lagos. He reminded the people of the state that the Lagos State Environmental Sanitation Law prohibits anyone from hawking or buying and selling goods on rail lines, including all road setbacks and walkways across the state. â€œStrategically, this unusual and very risky trading practice has led to the death of some people. The primary responsibility of any responsible and responsive government is to protect life and property of the people. Anyone caught will be severely dealt with in accordance with the law,â€ he said. Egbeyemi also warned officials of both local governments and market womenâ€™s associations to desist from collecting fees from the illegal traders on rail tracks in any part of the state. To match word with action, the Lagos State government on Monday began what it called â€œOperation all illegal traders must leave rail tracks in Lagosâ€ with the confiscation of wares being sold on the tracks. Taofiq said the operation had commenced at Ikeja rail track and shops erected on the tracks. According to him, different types of goods, ranging from used clothing, popularly called Okirika, shoes, belts, used electronics and gas cylinders, were confiscated. â€œIt will no longer be business as usual, until a zero tolerance on this is maintained. Anybody caught collecting illegal fees from these illegal traders on rail lines across the state would be seriously dealt with in accordance with the law,â€ he said. A driver who plies the Alagbado-Oshodi route, Humphrey lfeji, lamented: â€œl doubt anybody can totally stop the problem. During the day, everywhere will be okay, but immediately the KAI officials close for the day, the traders will rush out to occupy the road. They will block the space created for us at the bus stops to park and pick passengers. A Lagos resident, Funmilayo Adeshina, said the task force would soon be weary of the battle. She also accused some of the officials of collecting bribes from the erring traders.